We have an accountant who is not a member of our Chama. Is it possible to give him access rights without making him a member? /Uncategorized /We have an accountant who is not a member of our Chama. Is it possible to give him access rights without making him a member? On the side bar menus,click on the settings tab. 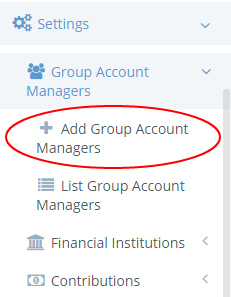 A drop down menus appears, proceed and select Group account managers the select Add group account managers. Settings>Group Account Managers>Add Group Account Managers. An interface appears as shown below. Fill in the account managers`s name, phone number, email address and click on add new group account manager to finalize. Immediately, an invite is sent to the account manager,with guidelines on how to log in. Can we install Chamasoft on our own server? What happens if I receive a Payment without an Invoice? Can I set membership numbers on Chamasoft? Why do I see https instead of http? What is SSL and will it keep my communications absolutely secure? What are the benefits of using Chamasoft? How do I access Chamasoft? How do I Pay for Chamasoft?